Frederick Vernon Cross (also known as Vernon Cross) was the youngest of the two children of baker Frederick Thompson Cross and his wife Elizabeth Waddelow of Ely, Cambridgeshire, England. Above: Frederick Vernon 'Vernon' Cross, 1919. Just before he was born, Vernon's father purchased a property on Forehill, Ely, and turned it into a bakery which he named Fred T. Cross (Variety Bread & Biscuit Manufacturer), selling all kinds of breads and confectionery. Vernon worked here as a Baker whilst as a young man. The success of the bakery resulted in it consuming the rest of the building, and in 1908 the Cross' set up what is thought to have been the first café in Ely, on the first floor. Vernon was interested in theatre, and at the age of 13 (in 1909) he was starring as a magician's assistant (to his father), and also as a ventriloquist. His career continued with travel that took him around the country to perform, but it was interrupted by the First World War. Vernon served as a Private in the King's Royal Rifle Corps, and during a period of recovery in hospital, he met playwright Noël Coward. After the war, Vernon returned home, although married Eleanor Crate in Somerset. It is not believed that the couple had any children. After his father's death in 1911, Vernon took the bakery on, and having exhumed fossils and other historical items from the excavation of nearby reservoirs 'Roswell Pits', he began to put the items on display. Eventually the bakery and tea shop, also became a small-time museum. 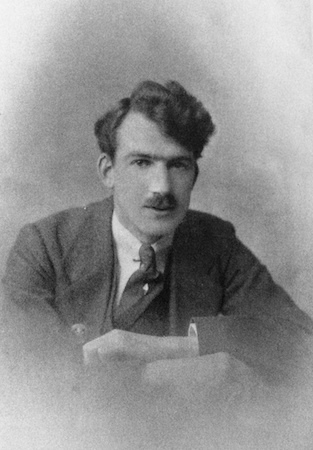 Vernon wrote about his life on the stage, and briefly about his experiences in the First World War and about his father, shortly before his death in the late 1970s. His collection of fossils, and his ventriloquist dummies helped to form what is now a significant part of today's Ely Museum, which has commemorated the Cross contribution by naming a function room after him. 22nd July 1894 at Ely, Cambridgeshire, England. Eleanor Crate (1894-1971) on 27th April 1920 at Wells, Somerset, England. 1901: 6yrs, Forehill, Ely, Cambridgeshire, England. 1911: 16yrs, Forehill, Ely, Cambridgeshire, England. WWI: Private (#A/202952) - British Army, King's Royal Rifle Corps. 11th February 1976 at Ely, Cambridgeshire, England. Aged 81 years. February 1976, location not yet known.